The species is widespread throughout most of Britain and, indeed, the entire Holarctic region. M. pulicaria is often to be found in open areas of short vegetation where there are scattered stones or small beds of stones. It has been recorded from most habitats particularly the warm, sunny parts of sandy heaths, chalk downlands, dunes and derelict land, but it has been found in saltmarsh, sphagnum filled hollows in dunes, moss in broad-leaved woodland as well as stony, bare, dry habitats. 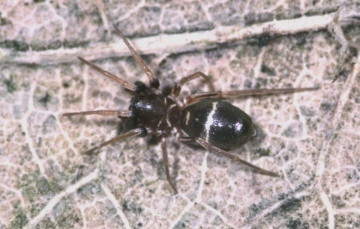 Although not myrmecophagous the spider quivers its front legs in an ant-like fashion which may help prevent it falling prey to larger spiders which generally avoid contact with ants. Females enclose the eggs within a stiff sac which is said to resemble a rimmed pot and although she does not guard them, Bristowe (1958) states that she returns frequently to check the egg-sac. Adults of both sexes have been recorded from early February to late November and mature specimens may occur throughout the year. Our data indicate the main season is late spring to mid-summer.